A few months ago I found this really cool montage video of a RAT pack (Riders Association of Triumph) ride on the Greek island of Thessalonica. I really enjoyed watching the video and it looks like everyone in the pack had a great day of riding. I don’t know that I will ever stand up on pegs and bow while riding a motorcycle, but I was definitely impressed that there were at least two guys in this group that can confidently do that move. But what really jumped out at me in the video is the fact that in the shots of the pack riding by, the riders with white helmets are quite a bit more visible than those in dark helmets. I watched the video a couple of times, including a few where I tried not to focus on the riders but rather on the scenery behind them or some other part of the computer screen. Every time a rider in a white helmet passed the camera, my eye was drawn to the screen, much moreso than when a rider in a dark helmet or even a silver helmet passed the screen. After seeing the video linked above, I switched from a dark helmet to a white helmet for safety. I was due for a new helmet anyway (my Scorpion EXO-400 was on its fourth season, had seen better days, and…well…it was starting to smell.) 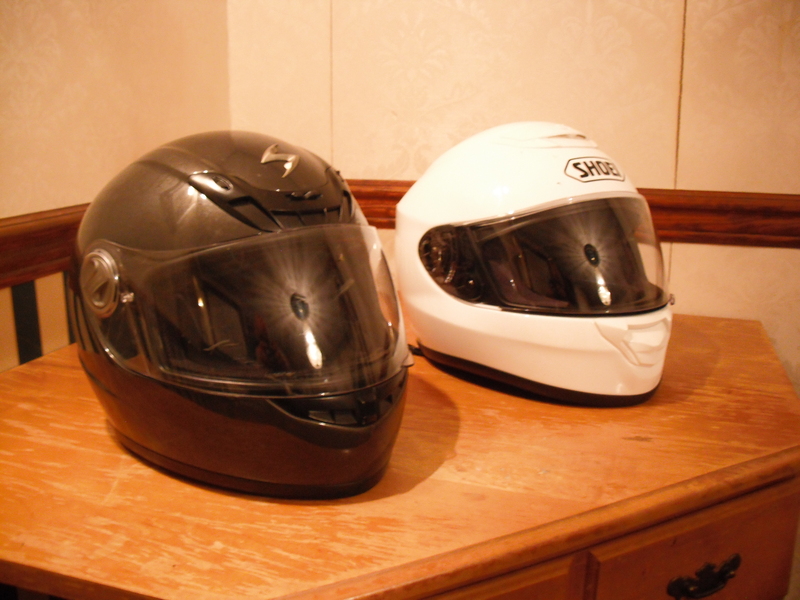 So when I ordered my new Shoei Qwest, I ordered a white one. I this is a good move to increase safety. I’m not nearly nerdy enough to wear one of those neon orange or yellow mesh vests that the old Goldwing guys seem to favor but a white helmet I can do. There’s no getting around the fact that for new riders, risk of crashing is high. There’s the challenge of getting comfortable with motorcycling in general and your bike in particular. Getting in the habit of scanning for hazards ahead. Even simple things like making a right hand turn at slow speed (something it took me a long time to master – a right hand turn is harder than a left hand turn because of the smaller radius of the turn.) The last thing you need is a soccer mom (or soccer dad) making an important cell phone call and not seeing you. Visibility is important. By buying a white helmet, you can at least incrementally reduce this risk.